1. Read the book. Listen to poddies. Gather information from all resources. When I first started THM, I started to explore it in December. During this time, I would take notes about THM in my bullet journal. While I pumped at night, I would listen to the poddies. I explored the THM related blogs on the internet. While I spent this month exploring, I would look up stuff on youtube for videos that are THM 101 sort of videos. Follow people on IG that post Trim Healthy Mama meals. I also borrowed a cookbook and would start trying the recipes out. Of course, I also have a few THM related videos on my vlog, Losing it With Shannon. One of the biggest keys to THM is that it is sugar free or low sugar (there are a few items allowed that have minuscule bits of sugar in it like True Lemon. Sweeteners that are preferred are things like stevia/stevia blends, monkfruit, erythritol, xylitol. Xylitol is hazardous to animals. This is a low glycemic diet and our main focus is to keep our blood sugars stable. You may have to experiment with what is your perfect sweetener. I will admit, I am a THM Rebel. I will bake with splenda and I will use splenda products if I have to when I am out. It has not affected my weight loss but your results may vary. I was still fully counting WW points via iTrackBites when I first started. I just played around and found some favorites. I wasn't trying to fully switch to THM but I loved the recipes. After a few months, boom, I was accidentally planning a fully THM week. Once you read the books, it can be easy to "trimmify" your old favorites. Although I found if you had a pasta heavy diet, it is very hard to trimmify them using dreamfields. Or it is possible but you definitely cannot eat them multiple times a week. Certain frankenfoods like dreamfields are best limited to a few times a month. I combined this one because I feel like overhauling your entire diet can set people for frustrating start. As you start trying recipes, note what you like. Eventually you will just accidentally be fully THM. Start with one meal at a time and you will be fine. No need to say, I will be completely 100% until you are ready for it. I was trying THM recipes for a month. Focusing on one meal at one time. Eventually I was there and you will be there, too! 4. Find a buddy or a support system. Finding a buddy or support system will help you succeed so much easier. It seems silly but having someone to report your frustrations to can help so much! These people can motivate you, help you when you are confused and more. It can be frustrating a first when you are started THM. I feel like this is an excellent tip even if you do not follow THM. 5. Write a list of your motivations. When you start a new way of healthy living, you will have moments where you are struggling. What should you do? Remind yourself of why you are doing this! This has helped me through a lot of hard moments. When you craft your list, make a list containing a variety of different goals. Long-term, short-term, scale related, non-scale related, health related, clothing related, family related and even more. This ensures that through your entire process you will reach a goal on your lists and you will still have more to reach the longer you stay on plan. A few of the ones I had was: healthy future pregnancy, rehab my knee, be able to do the advanced forms of barre, have less heartburn, reach Onder-land, etc. Read this daily and whenever you are struggling. 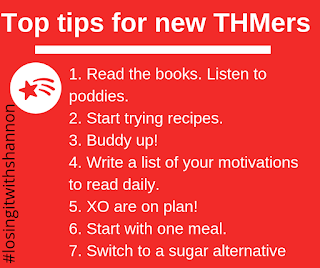 As you are exploring THM, start crafting a list that of easy, go to meals or snacks. Ensure that you almost always have these ingredients. Place this somewhere in your kitchen. Those moments you are so exhausted and you are tempted to go get the pizza, you can make this easy delicious meal and stay on plan. Some of mine are: ramen, eggs and okra, pizza sandwich with veggies, deli sandwich with veggies. The list can go on and on. Always keep those items stocked and your life will be so easy. Remember, if you accidentally cross over, it is okay! You will improve the longer you do this. One of my best tips is to become familiar with what makes something an S or an E. I always look for the "key" ingredient that will make it an S or an e. Once you can spot the key ingredients, it will be easy to spot the S, E or XO recipes. A crossover is when you have both carbs and fats in one meal. Also, when you are pregnant, nursing or at goal, you will definitely need more XOs in your life. If you are very active, you may also need a XO or two through the week. I like the idea of filling half my plate with a non-starchy vegetable. They are all FPs in the THM lingo. If you need a refresher of a non-starchy, here is a guide of common ones. Remember, THM does not count the carbs in non-starchy veggies. So don't worry if you keep eating 50 grams of carbs of broccoli. I recently just saw someone was worried about their veggies. Although if you are a veggie hater, I am not sure how to overcome it. I feel like that is the biggest component of THM. 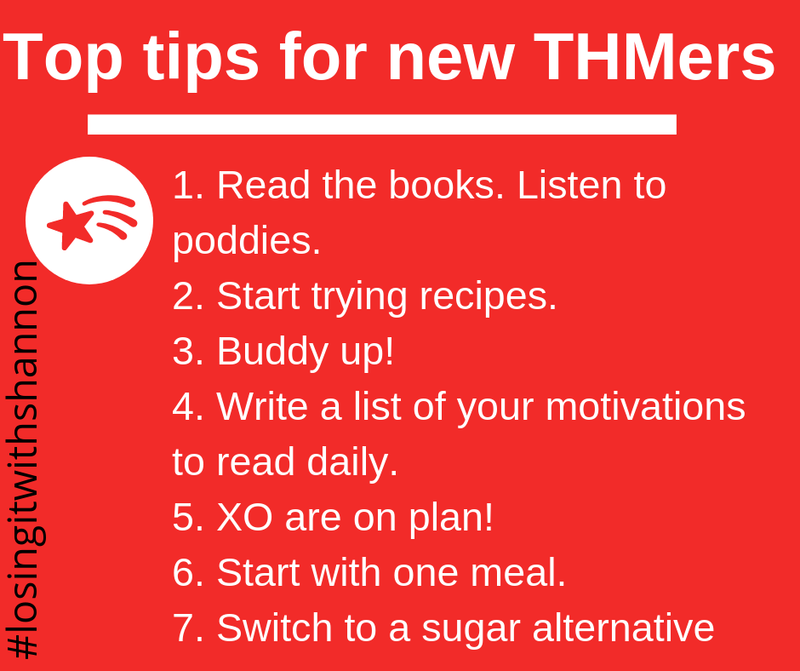 I think these are my best THM tips. A lot of these can help you even if you do not follow THM.